We are super excited to announce our new location for the 2018 Market Season sponsored by Grange Co Op! 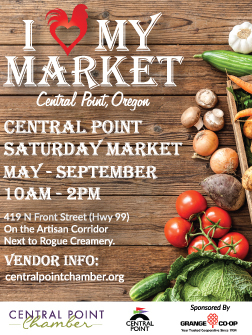 You are familiar with the Central Point Artisan Corridor that host Rogue Creamery, Ledger David and Lillie Belle Chocolates!! We will be just north of the Creamery at the old Crater Iron Works covered parking area. We are looking for vendors to showcase all of our local and regional butchers, bakers, and artisan makers! 419 N Front Street, that?s Hwy 99, Saturdays starting May 5th to September 29th, from 10 am to 2 pm. Once your registration is completed online the Chamber will contact you with available times to have your product(s) juried. Please be prepared to bring your product(s) and picture your entire set up. Requested to be added to the ?drop in? vendor list at the full price rate of $25 per market. Note we cannot guarantee space will be available at each market if you are a "drop in". If your business does not have insurance you may apply for the Market insurance that is available to vendors who commit to the entire season and pay the $330 at the beginning of the market. The $330 covers the booth fee for the season as well.